Free Shipping Included! 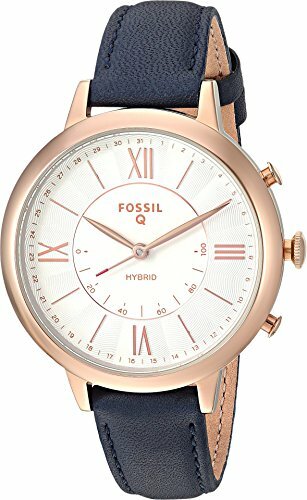 Fossil Hybrid Smartwatch - Q Jacqueline Navy Leather FTW5014 by Fossil at Kode Fu Guru. MPN: FTW5014. Hurry! Limited time offer. Offer valid only while supplies last. Never a miss a beat in this stylish Fossil® Q Jacqueline hybrid smartwatch. Stainless steel case. Leather strap with adjustable buckle closure. Never a miss a beat in this stylish Fossil® Q Jacqueline hybrid smartwatch. Stainless steel case. Leather strap with adjustable buckle closure. Round face. Dial features rose gold-tone hands and hour markers, single subdial, minute track, and Fossil Q detailing. Activity Tracking: Track your everyday accomplishments: steps, distance, and calories burned. Sleep Tracking: Monitor your sleep duration and quality. Alarm Clock: Whether it's a vibration or audible alert, set an alarm for wake-ups and workouts (and every reminder in between). Charging Not Required: Your Fossil Q is always on and always connected with a battery life up to six months. Smartphone Notifications: Be notified of important texts, calls and app updates- all from your wrist. Control Your Music: Control your music with your phone's selected music player. Auto-Update Time/Date: When traveling to another time zone, your Fossil Q automatically updates to the correct local date and time. Take a Photo: Take a photo with your phone camera app or Snapchat®. Wireless Syncing: Automatically syncs to your phone so you can keep tabs on your activity and notifications without ever pushing a button. Customizable Watch Straps: Match your Fossil Q to your look in seconds with interchangeable straps. Water resistant 50 meters. Display case included. Imported. Measurements: Case Height: 36 mm Case Width: 36 mm Case Depth: 12 mm Band Width: 14 mm Band Circumference/Length: 8 in Weight: 1.6 oz This product may have a manufacturer's warranty. Please visit the manufacturer's website or contact us at warranty@support.zappos.com for full manufacturer warranty details.